Dr. Kinga Kostolowska (Dr. Kinga) earned her Doctor of Dental Medicine degree from the University of Pennsylvania School of Dental Medicine. With nearly 25 years of experience in private practice, Dr. Kinga and her expert and friendly staff are unconditionally dedicated to improving the quality of your life with the help of the latest and safest innovations in dental techniques, technology and materials. Dr. Kinga's practice philosophy is quite simple: she sees each patient as a fellow human being in need of professional assistance whom she and her staff serve with utmost care to his or her total satisfaction. 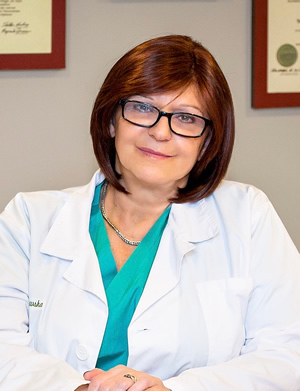 Dr. Kinga is an avid believer in continuing education and since graduation from the School of Dentistry she actively enhances her education and training by attending continuing education course as well as study clubs around the country. Dr. Kinga is married and has one daughter. Her interests include: traveling, snow skiing and scuba diving.